It must be nice to be the president. In addition to having helicopters, jumbo jets, and motorcades, you get to rifle through the cellars of the National Gallery and the Hirschhorn for artistic masterpieces to adorn your home for the next four to eight years. As with all of our recent presidents, the artistic choices made by Barack Obama and his wife (since first ladies traditionally play a big role in decorating the White House) say a lot about the first couple and what they want to say about themselves. It is evident, for example, that the Obamas (with their selection of Degas sculptures and Morandi still-lifes) are far more Europhile than either the Clintons or the Bushes (father or son), and one is struck by their willingness to live with art that is not only avant-garde, but also on occasion downright radical. Selecting these works is somewhat more complicated than you might suppose. The first couple can borrow almost anything for their private quarters, but as regards their selections for the public parts of the White House, a complex vetting process takes place. Among other considerations, because a presidential acquisition invariably sends prices soaring, an artist must be dead at least 25 years before being admitted into the permanent collection of the White House. So what do the Obamas' choices say about them? 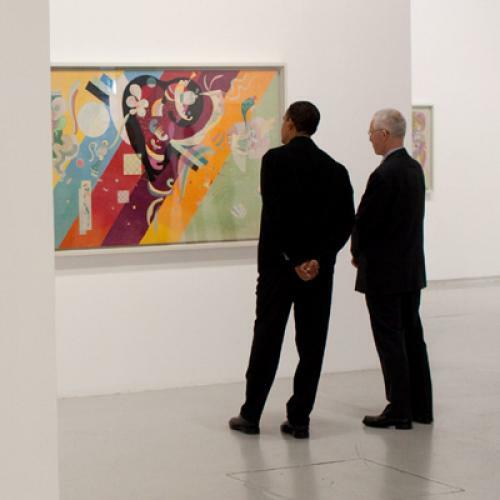 They may well be the first couple in the White House to prefer abstraction to representational art. And while it is always possible that they simply liked the works in question, one is well-advised to interpret each selection as a message sent. Click through the slideshow to find out what those are.